Hornets build their nests with paper-like material produced by the hornets mixing wood fibers and their saliva together. They are social insects that live in colonies within the hive. 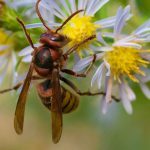 Hornets are often considered pests, particularly when they nest near homes, as they will defend their colony and nest aggressively if they feel it is threatened by intruders. Hornets can sting multiple times, and their sting is more potent than a bee sting. Hornets nest in house eaves, hollow trees, barns, out buildings, hollow walls of houses, attics, and abandoned beehives. When the spring months arrive, the queen hornets will emerge to start building their nests in new locations. Hornets look for a sheltered location to make their nest, and as this will protect them from the weather and being disturbed. Do you have hornets in your walls?